2017 has already proven to be a destructive hurricane season for America, and it isn’t over yet. Hurricane Maria is currently a very strong category 4 storm and just wreaked havoc on the Caribbean Island of Dominica and now has its sights set on Puerto Rico. Puerto Rico’s governor Ricardo Rosselló has already declared a state of emergency and President Trump has already issued an emergency declaration for federal assistance to aid in relief from the hurricane, should it hit the US Territory. It is too early to determine the ultimate path of Maria and the impact it could have on America, but if it makes landfall this will be the 3rd major hurricane to hit the U.S. in 2017. The recent catastrophes in Florida and Texas, Hurricanes Irma and Harvey, have reminded us of the dangers of natural disasters and the impact they can have on family, friends, loved ones and the economy. Many of the impacted people have had their homes destroyed and are left devastated from the loss of not only their physical dwellings, but also their invaluable personal belongings. Hurricane Harvey was the most powerful hurricane to make landfall in Texas in over 50 years. Hurricane Irma was the most powerful hurricane to hit Florida since Hurricane Andrew in 1992. According to Moody’s Analytics, the expected cost of these 2 hurricanes will top $150 billion, excluding the cost in Puerto Rico, making them as costly as Hurricane Katrina. Governor Abbott of Texas has estimated the cost in Texas alone to be at least $150 to $180 billion. Former FEMA chief James Lee Witt has estimated the cost in Florida alone will top $26.5 billion. Now that the waters have receded and people are able to return home, homeowners and multifamily owners are currently assessing the damages and one of the main questions is: Who will cover this estimated $150 to $180 billion in damages. Often times, owners of residential communities only carry insurance limits and insurance types required by lenders, and often times these insurance limits are not sufficient to cover actual losses from flood, wind and natural disasters. Unless a property is located within a flood plain or close to the coast, the likelihood is that the owner does not carry enough flood insurance to cover the cost of flood damage. The same goes for wind damage. Catastrophe insurance would cover part of the loss to a property in the case of a natural disaster, but not all owners carry this type of coverage. 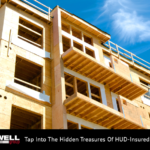 So, what options exist as it relates to restoring a hurricane damaged property? Typically, federal and state government programs are funded in order to assist with covering part of the cost or providing funding in the form of grants or loans for the rebuilding after a natural disaster. One such program is the National Flood Insurance Program, which is a program under FEMA. Additionally, products such as low-interest rate disaster loans are provided by the Small Business Administration to eligible businesses. As of September 18, 2017 the federal government had approved funding of $15 billion in Florida and $15.2 billion in Texas. Most have estimated these funds will last less than a month, thus requiring significant additional funding in the near term. When the rebuilding has occurred and Floridians and Texans return to life as normal, many will be stuck absorbing part of the loss as a result of these natural disasters. Given events such as these occur infrequently, often the accounting for such matters is misunderstood or overlooked altogether. Things accountants should be thinking about are insurance coverage and contingent losses or gains, and asset impairment. Total destruction – irrespective of insurance claims and proceeds, the entire asset should be written-off in the period the damages occur. Partial destruction – irrespective of insurance claims and proceeds, the net book value of the portion of assets damaged should be written-off in the period the damages occur. Loss on involuntary conversion – Expected proceeds should be accounted for in the period recovery of the proceeds is probable (“The future event or events are likely to occur”). A loss for the damages incurred should be recognized as a period expense, and offset by any probable insurance proceeds, net of the deductible. If damages occur in one period, but the claims are not finalized and collection is probable the loss should equal the actual write-off discussed above. If the collection of insurance proceeds is determined to be probable as of the fiscal year-end or prior to the date the financial statements are available to be issued (treated as a type 1 subsequent event and recognized in the financial statements) the expected proceeds, net of deductible, should be recorded as an offset to the loss recognized. If the receipt is not probable before issuance of the financial statements than recognition of the proceeds should be deferred until a future period. Gain on involuntary conversion – Insurance proceeds in excess of the basis in real property are accounted for as a gain contingency. Gain contingencies should not be accounted for in the financial statements until the period in which the contingency is removed. As it relates to insurance claims, contingencies related to the amount to be received typically are not removed until the insurance company issues a final settlement or the actual proceeds are received. An estimation of settlement received from an insurer does not remove the contingency related to the proceeds to be received. The recognized gain is the excess of proceeds over the net book value of the assets written-off. 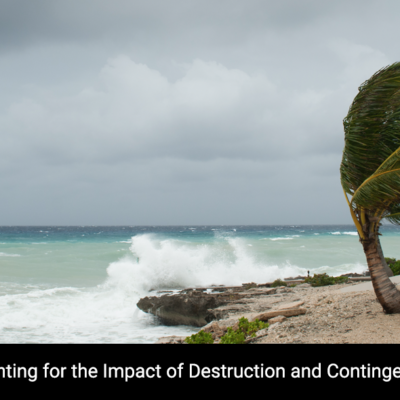 In many cases the damages caused by Irma and Harvey will result in total destruction, or almost total destruction of a property. Also, the voluminous claims that have and will continue to occur could drag the claims settlement process into 2018. The finalization of any federal grants or other federal and state funding could take significant time to resolve, including agreeing to a probable settlement that is estimable and probable. Thus much of the accounting for Irma and Harvey will likely not take place until 2018 and beyond. Most owners of real property in the impact zone of hurricanes Irma and Harvey will have to deal with insurance claims and accounting for damages from the storms. Given the unique nature and infrequency of accounting for natural disasters there will likely be uncertainty as it relates to recording the impact. We are here to help. Please reach out to your Tidwell Group Partner or Josh McCabe.